A couple of months ago I watched The Close Up on eNCA. The show is written, directed and narrated by Nicky Greenwall and features different South African personalities telling their stories. 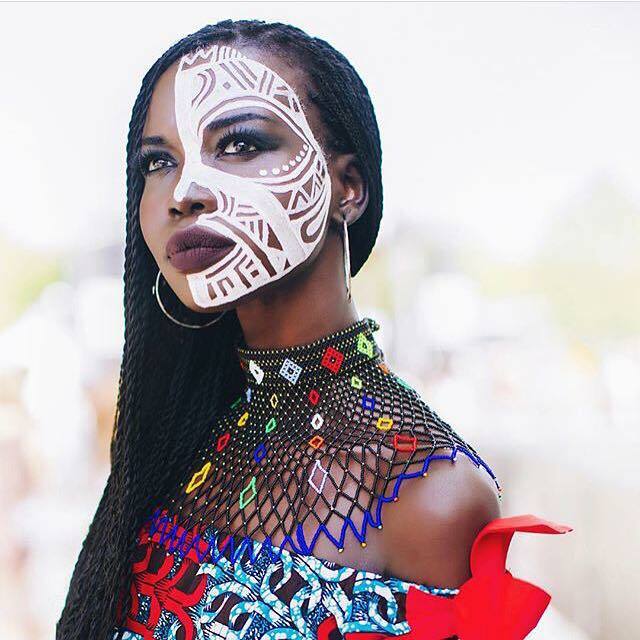 On that lucky day, it happened to be a bit different, a South Sudanese model, Nykhor Paul was featured which I found refreshing for a change and of course I had to share, although I'm still not sure what took me soooo long to share this story! Any who, here's how her story goes. Her name Nykhor means war. She has appeared in campaigns for renowned designers; Louis Vuitton, Vivianne Westwood to name a few. She felt guilty for being in an environment where people were popping champagne bottles for 5000 to party, being a supermodel made her feel guilty. The supermodel details her childhood in Akobo, South Sudan, where she was born, slept on the floor, was naked most of the time, bare foot, lived in thatched houses with beads around. She recounts growing up in multi-ethnic South Sudan made up of sixty four tribes, where their unifying language was Arabic but each tribe still had its dialect. No electricity, no phones, no toys and all those perks that come with modern day life. How they led a simple life, her mum had a garden, they would go fishing in the Nile river, her dad was a pastor, a well respected member of the community. How in South Sudan cows are their richness therefore the more cows you have the richer you are. But things went down south when the same symbol of wealth, cattle, turned into a source of hostility between rival tribes, young girls were married off in exchange for more cattle! (Can you imagine?) Because girls are interchangeable just like that. She states how that was always a fearful thing. When war sparked, she was worried about houses being burnt down which they did, some people's houses got burnt down. Tribes were forced to cross rivers in large groups, war broke out between the tribes, as a child, she witnessed bodies floating on rivers, kids drowning. As a child, it never made sense to her how a close knit group of people; living with 20000 people who looked like her killing each other. When the tribal war started brewing in 1995, they fled South Sudan and embarked on a long trek,crossed the Nile all the way to Ethiopia where they lived in a refugee camp. Unfortunately Nykhor's father remained behind with her grandmother who was unable to make the journey. Women and children were escorted by a group of male volunteers. On their way they encountered men with guns who started poking women and their bags, they were held at gunpoint, then they told them they are not going to let them cross the river. They told them either they go back where they came from or they kill them..... Then one of the guys was looking at Nykhor's mother, he told her he knew her from somewhere, and her mum goes, "I know you from somewhere too". They used to play together as kids. He tells the other guys with guns, I know this woman, take this woman and her kids from that group. They managed to make it through but they only asked for her mother and her 3 kids, she had to leave her friends. Nykhor says she doesn't know what happened to those people they left behind, either they got back to Akobo or they got killed. You would think getting into a refugee camp was easy but it wasn't, they had to fight to get in, register as family members then get a card from the United Nations as legal identification that you are a refugee. Every month, they would give them food in relation to the number of your family. Forex ample if you are a six family members, you would get 6 scoops of food. They lived in a refugee camp for several years until an opportunity presented itself for political asylum in the US, they missed the first opportunity because their family was big to go; meaning they didn't meet the terms and conditions (a specific number was required), then another one came for her uncle and wife, so her father said she can go with her uncle because she will have a better life. In 1998, then 9 year old Nyakhor left her mother and family for New York. She says she didn't want to go, she wanted to stay with her family, she was scared and sad. Her next destination was Houston Texas. She was fascinated by the toilet, how it flashed. She later enrolled at an American school to learn English, while settling in the US, her uncle and aunt found it harder to transition into the American life. She was not getting along with them at all as a teenager. She couldn't focus at school, her aunt had four kids, she had to be the babysitter, had to cook at least four stews a day. She felt like a housewife while her aunt and uncle worked. Things got worse when her aunt and uncle started abusing her. One day while at school her teachers noticed she would come with either a scar or a swollen eye, eventually Nykhor was placed in foster care to protect her from her relatives. While in her foster environment, at the age of 13 to be precise, she would get comments from people at church and school asking her whether she's a model. One day she was going to the mall, walking around, there was a scouting taking place and these judges kept on staring at her because she was so tall. One of the judges approached her and told her she's doing a scouting, she's from Ford Models Chicago, "I think your amazing; you should come audition for us" ...She was kind of hesitant. Nykhor didn't win but this sparked an interest in modelling. She then enrolled at a modelling school before spending the summer trying her luck in modelling in California. Then there were photographers who wanted to work with her through the modelling school but unfortunately something happened to her there; she almost got raped and it just turned her away from modelling. As if that wasn't enough, her foster mum was going through a divorce and single foster mothers were not permitted to foster children in that state. She had to move again! She did a couple of modelling jobs after people sitting down with her and encouraging her to take on modelling as a career. They told her if she did modelling, she can make XYZ amount of money and she can help her family in the refugee camp and also help herself. "I don't have any insecurities, I think I'm a beautiful gorgeous Black woman." She then got a job at a local grocery store while still attending high school, then after that enrolled at a local university to study biology and psychology before working as an abattoir - she worked there for one year and managed to save 15000 USD. That is when she moved to the complete jungle where dreams are made of, NEW YORK CITY in search of better opportunities as a model. Once she got there, she started to educate herself about the industry. She was now an adult, no longer living in foster care, living with friends and relatives but soon learned landing a high profile modelling job was not as easy as she had thought. She was being rejected by agencies some agencies she approached even told her they had someone like her. This had her confused, because while people kept on telling her she looks like a model, agencies were turning her down. Now, who was telling the truth? They were telling her if you're not modelling you need to be modelling; it drove her mad. As if going from one agency to another and hearing NO wasn't enough, things got bad, she was living with another fellow Sudanese model Grace Paul, they couldn't afford rent, the first night she slept in a park and ended up homeless; she kept on asking herself "I came to America for opportunities. America is the land of opportunities why the hell are my opportunities not happening?" After all that up and down situation, she got a job as a hostess at a French brasserie, she eventually landed an agency through a model scout although it wasn't her first choice. Then came her first editorial in Glamour Magazine and in September 2008, a couple of months after she moved to NYC, she booked the coveted holy grail of the modelling industry, New York Fashion Week! Like they say, the rest is history. The 27 year-old has used her platform to create awareness about the plight of her family and South Sudanese people still living in refugee camps. She returned home in 2013, her parents, sisters still live in a refugee camp. It was such an emotional reunion; she left these people behind almost a decade ago. She says everything made sense when she returned, how she almost forgot she had parents due to the life she lived in the USA, hustling like her life depended on it. She was fighting for her life. Even though she's got a successful career, I like how Nykhor uses her platforms available to her to express and share what's happening in South Sudan. She has not given up on them. Her story taught me that even when you have what it takes, some people may not see it but it doesn't mean you don't have it, it's just that the timing ain't right, yet. It also taught me the beauty of FOCUS and RESILIENCE and of course never giving up. From despicable hardships she has endured to internationally acclaimed super model. Thank you for sharing your story, Nykhor. I hope her story inspires you not to give up on this life thing that we're all trying to figure out.